496 pages | 1 B/W Illus. 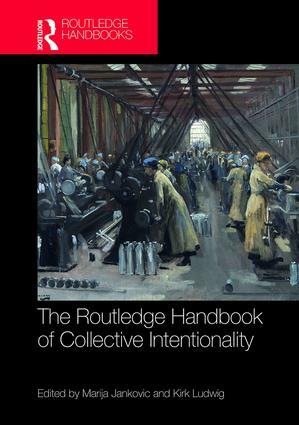 The Routledge Handbook of Collective Intentionality provides a wide-ranging survey of topics in a rapidly expanding area of interdisciplinary research. It consists of 36 chapters, written exclusively for this volume, by an international team of experts. What is distinctive about the study of collective intentionality within the broader study of social interactions and structures is its focus on the conceptual and psychological features of joint or shared actions and attitudes, and their implications for the nature of social groups and their functioning. This Handbook fully captures this distinctive nature of the field and how it subsumes the study of collective action, responsibility, reasoning, thought, intention, emotion, phenomenology, decision-making, knowledge, trust, rationality, cooperation, competition, and related issues, as well as how these underpin social practices, organizations, conventions, institutions and social ontology. Like the field, the Handbook is interdisciplinary, drawing on research in philosophy, cognitive science, linguistics, legal theory, anthropology, sociology, computer science, psychology, economics, and political science. Finally, the Handbook promotes several specific goals: (1) it provides an important resource for students and researchers interested in collective intentionality; (2) it integrates work across disciplines and areas of research as it helps to define the shape and scope of an emerging area of research; (3) it advances the study of collective intentionality. "This superb handbook provides a broad survey of the scope and direction of the rapidly developing field of collective intentionality. Itself a collective enterprise by a body of international experts, this work is a must read for every student, teacher and researcher working on this exciting new interdisciplinary domain." "This collection stands as an excellent record of the state of current research on the subject of collective intentionality. One welcomes the summary statements by some prominent figures in the field of their own seminal contributions, and one is instructed into the directions in which further inquiry is now proceeding. Each of the contributions is well informed, clear, and cogently argued. Taken together they reveal a wider significance of collective intentionality not only in human inquiry but in human affairs." Marija Jankovic is Assistant Professor of Philosophy at Davidson College. Her areas of research are collective intentionality and philosophy of language. Kirk Ludwig is Professor of Philosophy and Cognitive Science at Indiana University, Bloomington. He works in philosophy of mind and action, epistemology, philosophy of language, and metaphysics. His most recent books are From Individual to Plural Agency (2016) and From Plural to Institutional Agency (2017).